Our Hebrew school uses the Behrman House publishing company for our Hebrew educational materials. The educational materials from Behrman House include not only the print books we use in the classroom but also online materials for use at home. The Behrman House online homework page is called the OLC, or Online Learning Center. Follow the guide below to learn to sign on to the OLC. Open the mail sent to you by Behrman House. Note your child’s user name (firstname.lastname@uvjc.org) and password. If you have ever been on this site, you might be signed in. On the top right, sign out. This allows your child to sign in under her own account. Click on OLC in the middle of the top bar. 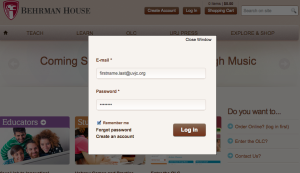 At the login screen, enter your child’s username and password (e.g., sam.jones@uvjc.org.) The username and password are both on your email invitation. If you would like, change the password to something easy to remember. When your child is assigned homework, she will go to her teacher’s name on the website and hit the play button, and the homework will be there.